Last year, the Apache Junction, Arizona, Sewer District began to contract for construction of a new sewage treatment plant. This project included the installation of more than 100 miles of mainline sewer, and over 3,000 service lines - some of which hooked up private residences connected with septic systems from the RV parks that dot the landscape. Lee's Backhoe and Pipeline of Chandler, Ariz., installed half of the project: 50 miles of mainline sewer and 1,500 service lines. This 16-square-mile section was completed December 1995. In this section, sewer lines ranging from six to 36 inches in diameter were installed; most of which was done in caliche. On this job, there were two crossings of Highway 88 - a four-lane road with an additional turning lane. Twelve-inch-diameter sewer line was to be installed 11 feet below the road and connected to other sections of the installation. One crossing was 170 feet, the other 120 feet. 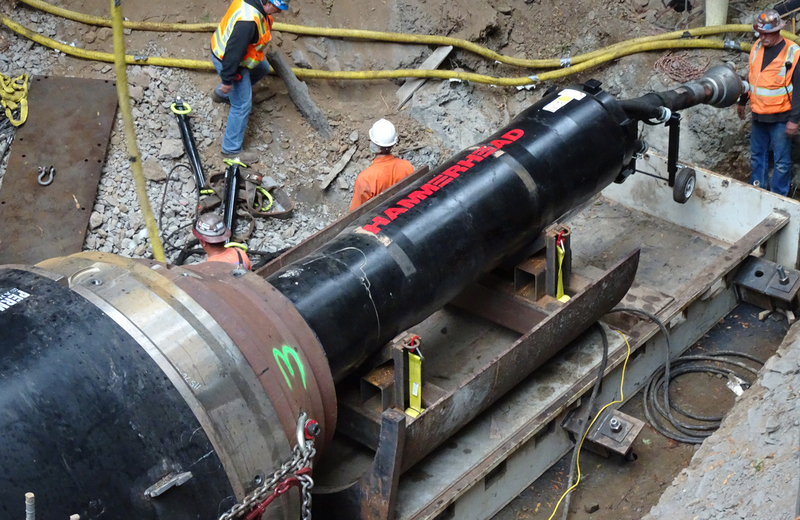 Auger boring was one option considered, as was pipe ramming with a pneumatic tool. The steel casing that would carry the 12-inch sewer line would be 24-inch-diameter steel pipe. John Lee of Lee's Backhoe decided to use the pipe-ramming method, expecting it to save him time and money. "Auger boring works fairly well in this caliche soil," Lee explained. "But it's slow, and we've found it to be a time- and labor-intensive method. It takes three to four workers, some of whom have to shovel away the spoil that comes from the auger. It takes time to set the pipe up and even more to set up the auger machine." For the longer of the two rams, the crew used a 12-inch-diameter HammerHead Mole with such on-site support supplied as was needed by the local authorized HammerHead dealer. The crew dug an entrance pit and graded the floor to one-half of one-tenth of 1 percent rise over run. Grading carefully using laser transit equipment, the crew took extra care so that the gravity sewer matched the blueprint grade for the entire 170 feet. With the entrance pit floor level, a 40-foot I-beam was set in place for the casing to ride on. A cutting edge soil shoe was fabricated from a piece of the 24-inch-diameter carrier casing and welded onto the front of the pipe. The diameter of the cutting edge was slightly larger than the diameter of the pipe, to lessen the friction between the soil and pipe as the casing entered the ground. A one-half-inch lubrication pipe was welded to the top of the casing and fed into a small hole near the front of the leading edge. This allowed water to be pumped to the inside and outside of the front edge. This moistened the hardpan enough to make ramming the steel casing possible and to ease the job of spoil removal. The first day the HammerHead Mole was set in collets and placed into the pipe, the crew finished the first 80 feet in four hours. The ramming rate was six to eight inches per minute, even at 150 feet into the push. Welding on the new pipe sections with three pass welds took two hours per joint connection. To accelerate the ramming productivity, at 70 feet into the punch the crew removed the tool and the collets, cut a blow hole 15 feet from the rear end of the casing and blew the hard-packed spoil back into the entry pit, having removed all crew members from the area before hand. With 15 more feet of spoil-free area, the ramming productivity improved. Total ramming and welding time for the completed 170-foot ram was 16 hours. The spoil was removed from the casing with high-pressure air and the use of a pipe pig. Because it was a carrier pipe for the 12-inch sewer line, accurate ramming of the 24-inch steel casing was critical. The outcome of this preparation was an accurate ram. The casing was dead on the horizontal target and slightly higher than the vertical target. Lee has more plans for his pipe-ramming crew now that he sees the time and labor it saves. "If you count excavating up the entry pit, getting it graded, ramming and spoil removal, this job took three days. That is certainly less than the week and a half I planned on. The added benefit of this project is that the company can add another area of accomplishments to its list of abilities."